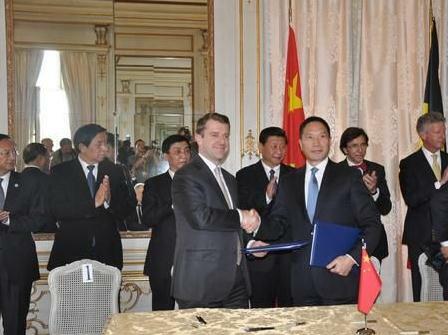 News from China shipping: on March 31, 2014, China shipping group with maersk group signed in Brussels on Belgian zeebrugge terminal investment and relevant cooperation agreements. China shipping group managing director Mr Zhang Guofa with maersk group vice President Mr. Francois Delenclos Signed the agreement. As an important part of the achievements of bilateral economic and trade cooperation, Chinese Vice President Xi jinping attended the ceremony, and witnessed this historic moment. According to the agreement, China shipping group (Hong Kong) co., LTD., in the acquisition of APMT maersk group 24% stocks right, would discuss the feasibility of a joint venture other container terminal on the basis of further strengthen strategic cooperation in terminal industry.